In case you don’t know, I LOVE cheese. So when I was selected through Foodbuzz’s Tastemaker Program to host a Sargento cheese tasting gathering – you know I was stoked! The purpose of this cheese tasting gathering was to compare Sargento natural cheese with processed cheese. I can’t tell you the last time I had processed cheese in my kitchen. However, I can tell you that it was my first cheese love. I remember being young, around 4 or 5, and wanting nothing but processed cheese slices, plain. My favorite sandwich was two pieces of bread, mayonnaise and a slice of processed cheese. Aw man, I have come a long way since my processed cheese eating days. ;) Now I am a cheese snob, and how could that possibly be a bad thing? One of my favorite sayings is, “The only thing better than cheese, is melted cheese.” It’s so true for me. Grilled cheese sandwiches, quesadillas, cheeseburgers and pizza – all have melted cheese, and if the cheese is not melted it could ruin your eating experience. 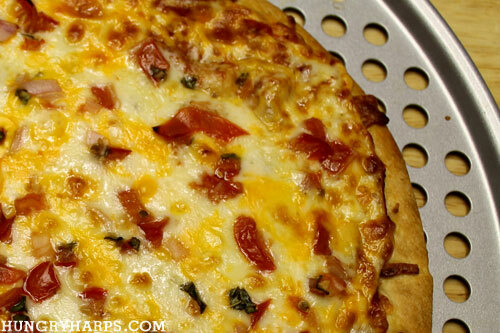 I chose to make a pizza for my guests, half made with Sargento cheese and the other half made with processed cheese. For our pizza I chose to use Sargento Provolone and Colby Jack on one side and processed American cheese on the other side. While picking out the cheeses at the store it was hard to pick which Sargento cheeses I wanted to use – their selection is huge! Their selection? Muenster, Colby Jack, Swiss, Pepper Jack, Havarti, Parmesan, Cheddar, Romano, Gouda, Mozzarella, Colby and Provolone. I wanted them all – honestly. When it came to picking which processed cheese to use, it was real easy – there is only one “flavor”, American. Since I could not find any shredded processed cheese, I had to get slices. For comparisons sake I ended up getting Sargento slices as well, just to make it as fair as possible. Since the cheese was going to be used for pizza I hand cut the slices of cheese into shreds. 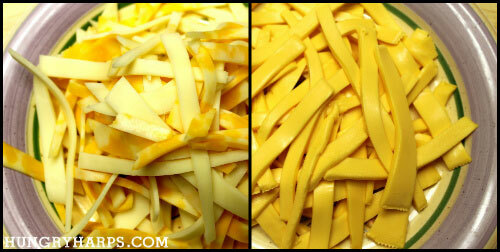 I cut the Sargento first – the cheese cut very nicely and was in shreds in no time. Then I cut the processed cheese, completely different story. The cheese shreds stuck to each other, the knife and my hands. It was a mess – and the grossest part came when I washed my hands. There was a film of slime on them, and it did not just rinse off. however the processed cheese is heavy - weighing itself down and making the pile look smaller. 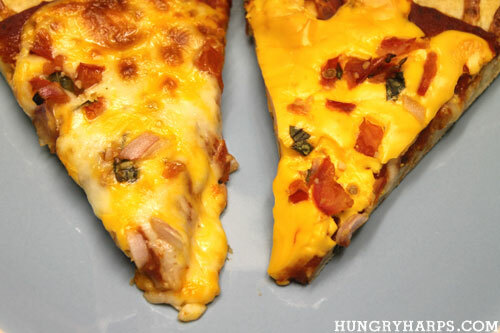 I made the pizza, half real Sargento cheese and half processed cheese. Visually, the main difference between the two cheeses was the shine. Processed cheese is very shiny – which is a quality I have never wanted in anything I have cooked. I popped the pizza into oven and within 5 minutes of cooking my husband asks me, with a disgusted look on his face, “What is that smell?” It made me laugh because he has never made this face while I was cooking before – and I knew it was the processed cheese he smelled. It is amazing that I could cook a pizza with toppings and all that could be smelled in the kitchen was melting processed cheese. Yuck! 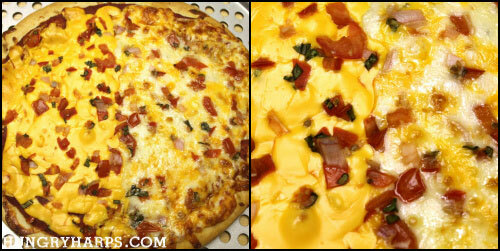 The cheese on the Sargento side of the pizza came out wonderful! The cheese melted, bubbled and browned. Just like good cheese should. It looked amazing. The cheese (can it really be called that?) on the processed side came out not so wonderful. The cheese didn’t really melt; it liquefied more than anything else. Both of these pieces are from the same pizza and are the same temperature. I suspect you want the one on the left? Taste? The two most common words describing the processed cheese were pasty and gross. 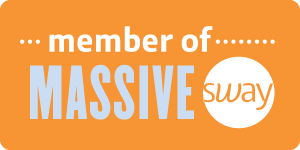 Everyone agreed that the Sargento side was wonderful – in both texture and taste. I had to Google what the advantages of processed cheese were – there have to be some, right? Well, if you consider the following advantages; extended shelf life, does not separate when cooked (it liquefies) and it is cheaper to make than traditional, natural cheese. Then we look at the disadvantages; processed cheese contains chemical preservatives, artificial colors and flavors and trans fat. Oh, let’s not forget the flavor – I would have to class that a disadvantage. So, reviewing the pros and cons I can only come up with one conclusion; processed cheese is not for my family. Thank you Foodbuzz & Sargento! Can't go wrong with pizza... love it. 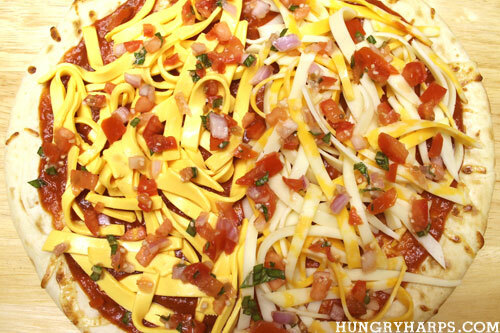 That is one BEAUTIFUL pizza (the sargento side). My mouth is watering. yum! I am totally a cheese junkie myself. Nice spin on the cheese taste test. Too bad half of a pizza was ruined. LOL! I used to eat processed all the time too when I was young. And I still sometimes eat with rotel or cheese dips. Do you have a good recipe for a cheese dip made with "real" cheeses? Thanks! What's better than bruschetta? Bruschetta pizza of course. Congrats on top 9! This looks amazing and yummy too!